those of you who don't see my posts on facebook or come in contact with us regularly may have wondered why it was that sam was sporting a spongebob bandage on valentine's day. well, in the interest of full exposure (not THAT kind of exposure! ), i thought i'd post the story here. last saturday night (the day after sam's third birthday), i was giving sam a bath and when it was time to get out, he slipped and bonked his head on the side of the tub. now, i don't know if sam's just got special skills or what, but somehow he was able to get a bad cut just below his eyebrow in probably the smoothest part of the bathroom possible. and because i've had previous experience with headwounds (i guess there's an upside to everything), i could tell just by looking at it that we'd be headed for the emergency room. so just like last time, i got him calmed down, cleaned up, dressed in pjs, and off the three of us went to see what the damage was exactly. unfortunately, this time they were not able to glue sam's head back together, and (after what seemed like ages) they were able to put stitches into the kiddo and we came home. needless to say, i was not pleased. 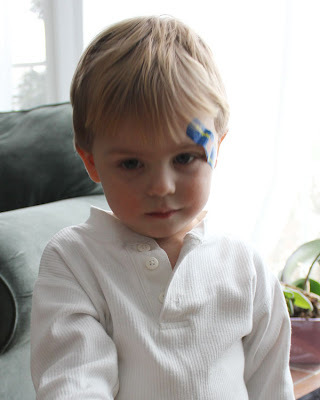 particularly when you know that the previous saturday night/sunday morning we'd made a trip to the same emergency room and had sam diagnosed with croup. we are now hoping that we can make it through the weekend without any incidents that require medical attention. please wish us luck, as it appears we will most likely need it.